My CD release Party tickets are now for sale. Folktale Winery in the Rose Garden. Doors open at 5:00. Minors are welcome! The CD will be for sale at the party! This is a pre street date party for my local and regional friends. It is not released to the public yet so If you get the CD at the party you will be among the first few to have it. Response to this band and this music has been fantastic and we anticipate another great evening in this magnificent setting! Special thanks to Mark Governor and the Folktale Winery for allowing us to have our party in such a beautiful place. Here is a preview of the Cover and some remarks from people who have heard it already. ” This is the guy who only needs to play one note to grab your soul. With that deep and gorgeous sound of his, he will tell you a story that even he himself hasn’t heard before. I had the pleasure of listening to his beautiful stories every night when we traveled together with Dave Weckl’s Acoustic Band. They always start completely different, seem to continue forever, and go beyond one genre. They take me to places I have never been before. Gary’s got so much vocabulary on which to draw, and to create so many different variations of his own beautiful world. His passion, respect, integrity, and love towards music are something you never miss feeling from his music. I’ve always admired Gary Meek’s sound and command of the horn. His new offering “Originals” has a beautiful flow, featuring both his tender side and ferocious versatility. We’ve played a lot of music together in this lifetime, and, again, you surprise me. This CD has the essential elements music requires to be pleasant, strong, and easy to listen to, without being boring. The compositions, arrangements and musicianship are excellent. The sound and the mix are round and transparent. Congratulations. I love it! 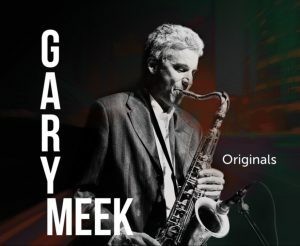 Gary Meek combines a unique mastery of his instrument with endless creativity and passion for music and the result is on full display on this excellent collection of songs. It was an honor to play a part in this recording and a true pleasure to hear the final result. Gary’s playing and writing is beautiful throughout and the production is flawless. This record deserves to be heard far and wide! Gary once gave me a saxophone lesson and encouraged me to play long tones. I just wanted to learn how to play harmonics like Coltrane. I suspect that Gary has put in many hours of long tone practice as his technique is amazing and he continually amazes me at how effortlessly he is able to make his unique voice heard. It is obvious from this recording just how skilled he is; as a player, a composer, and a band leader. What you might not know is that Gary is also an excellent piano player. He sent me some demos of these songs where he’d played piano. Brilliant. So being around Gary has had two serious consequences for me. I have given up trying to play the saxophone and realize that I must practice piano to stay a half step ahead of Mr. Meek. It was a privilege and honor to be part of this project and I trust you will enjoy the ride. For those of you who are not familiar with Gary as a solo artist, you will instantly become a fan for life. Even if you know his playing from the countless records on which he has recorded, you will get to truly know Gary as a person with this CD, as he bares his soul and opens up his spirit in a very honest and sincere way. Gary and I have been friends for many years and have played music all over the world. We have also recorded together many, many times. But, even for those of us who know Gary well and are fans of his playing, we are blown away by the depth and honesty of this recording. I, as the producer – as well as the bass player, on this CD, could not be more proud to be a part of something that is so special. It is truly a wonderful feeling when the music is so inspired that it takes on a life of it’s own. Thank you, Gary, for trusting me with your music, I could not be happier for you!